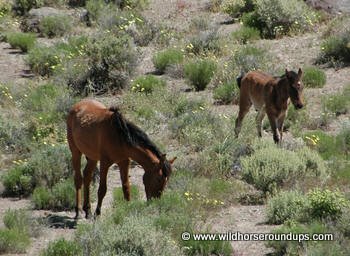 Wild horse roundups are necessary to maintain healthy herds of wild horses and burros out on the range. Herd numbers must be regulated by the U. S. Bureau of Land Management (BLM) so that each animal on the range has plenty of food and water. BLM managed lands are multiple use - this means livestock, wild horse, burro, and wildlife numbers must be managed to help assure food and water for everything and to minimize impact on the environment. Our business at Cattoor Livestock Roundup Company is to help capture, process, and transport wild horses, burros, and wild cattle in the most humane way possible. We have been contracting wild horse roundups for the Bureau of Land Management (and other agencies) since 1975. We have humanely captured over 150,000 wild horses, wild burros, and wild cattle during these years. Over the years, we have purchased and built equipment, developed techniques, and learned the best methods to assure the safety of the animals. We employ experienced helicopter pilots and wranglers that really care about the animals. All of this minimizes the stress on the animals during wild horse roundups. 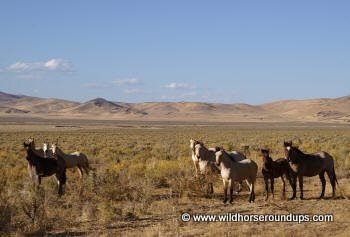 At this time, several wild horse interest groups are trying to get helicopter wild horse roundups stopped. The purpose of this web site is to have the full facts about the purpose and the practice of roundups available for anyone who reads them. We do work with wild animals. When we do wild horse roundups injuries can occur. But, the injuries are minimal and usually not life threatening and our death loss is less than .01%. When you balance that with natural death loss on the open range and the possible loss of life caused by drought, disease, and overcrowding of the range, you will be able to judge for yourself the necessity and humanity of these roundups. Please continue to our	Wild Horse Information Page to see questions and answers about wild horse roundups. If you have a question, please send it to us. If it is of general interest, it will be added to this page. Below is the introductory text from a recent Nevada Rancher article about Cattoors and roundups. For the original article with photos please continue reading it from the linked PDF below. NEPHI, Utah – Dave Cattoor has been gathering wild horses since before the Wild Horse and Burro Act was passed. Sue, his wife of 50 years, took pictures and made a photo album of a gather they did in Wyoming in 1971 and titled it "The Last Wild Horse Roundup." Thirty-nine years later, the Cattoors have expanded their operation to include their son and daughter-in-law, three helicopter pilots, a full ground crew, semi trucks, single-deck trailers, a fuel truck, and more. Cattoor Livestock and Helicopter Roundup Service regularly performs jobs for the Bureau of Land Management, Fish and Wildlife Service, Native American tribes, the Forest Service and various private ranchers.